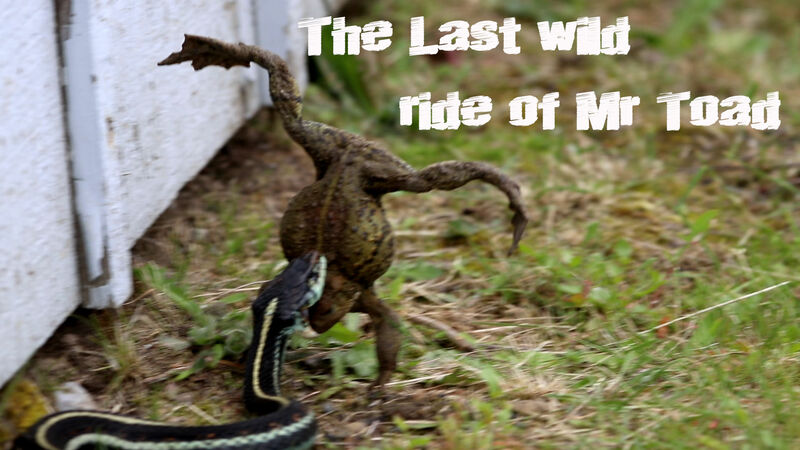 The Last Wild Ride of Mr. Toad - an epic wildlife encounter! Mr. Toad meets Mr. Garter Snake - who will emerge victorious? I filmed this video a few weeks ago near Mt. St. Helens. It's hard to get a sense of scale in the video - the toad was about the size of a large fist, and the snake was roughly 4 feet long and thicker than a garden hose - the largest garter snake I've ever seen! Re: The Last Wild Ride of Mr. Toad - an epic wildlife encounter! Quite a video. I'm frequently wrong about how large of prey a snake can manage to handle. Thanks - what really gets me is the way the snake didn't bother to disable the toad before eating it like other snake species would have. It just crunched it down! I've wondered about that sometimes. Many snake species are either venomous or are constrictors, but some are neither. Somehow they have to eat too.